We are a leading Manufacturer of perforated v bar from Ahmedabad, India. Perforated V Bar offered comprise splash type fills that provide for effective water cooling support and work on the principle of targeting fall of water through splash bars that further break the size of water droplets, thus increasing contact between water and air. These can be made available in standard sizes and with diamond/round perforations as demanded by the customers. Some of its features include compact design finish; ensure sturdy fill structure; superior clip design prevents from wear; high impact resistance of clips which also remain flexible in wide temperature range. 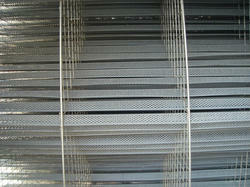 These perforated 'V' bars are suitable for cross flow cooling towers as well as counterflow cooling towers. Fixing clips made out of pp, For or S.S. grid are also available. Looking for Perforated V Bar ?